This past weekend on Saturday, my husband and I attended the opening reception of the SALI Midwest National Abstract Exhibition. One of my paintings, "Whimsical Garden", was accepted into the show, so of course I wanted to attend! Last year all three pieces I entered were accepted, but this year just one piece got in the show. I guess I shouldn't feel too bad, though, as this year only 49 paintings were juried in, as opposed to last year there were 90 paintings. My mother also had a wonderful painting in the show (wish I had a photo of it!) and I thought for sure she had won something because she had one of the best hangings in the show. The main wall right as you walk in, which has only five paintings hung on this long, huge wall. She did win first place last year, though! Gotta brag a bit about this wonderful artist-mother of mine, Shirley Despot. She's an amazing artist and the best art instructor I've ever had! I was lucky enough to study "Abstract & Non-Objective Art" under her for several years at the Indianapolis Art Center before she retired a couple years ago. I've taken many other classes and workshops since then, but all other instructors have paled in comparison. It's rare to find an instructor who is not only a wonderful artist, but someone who can TEACH their craft, as well. So many times I've taken a class from someone who has truly beautiful work, yet they haven't learned how (or aren't willing) to share their knowledge. So how do you know when you've found a terrific instructor? We're all given projects or assignments to do when taking a class. What makes one teacher stand out among all the rest? Well, for one, they know how to guide you to be the best that YOU can be... not a clone of their style, but an inventor of your own. You know how you get to a certain point in your painting and you get "stuck" halfway though? You look at it and know it looks really bad, but you just can't figure out where to go from here. You're saying to yourself "What was I thinking?" You ask your instructor to help you out of this mess and he/she tells you it "looks wonderful" and not to worry. You're in big trouble! You know it's a mess and so does your teacher... only they don't know what's wrong with it either! And even if they do know what's wrong, they aren't able to tell you how to fix the problem or where to go from there. So they tell you it looks great and they move on to the next person. We all know how to start a painting. That's the easy part! It's knowing how to finish it (and when to stop) that's the tricky part, especially when dealing with an abstract or non-objective piece. How do you know when it's finished? When there's nothing else you can do to make it better! When you have an teacher who can pinpoint what you need to do to improve your work... and is willing to share that knowledge with you... without taking the brush out of your hand and painting it herself (yes, unfortunately this has happened to me numerous times! ), then you know you've found what you're looking for. A great artist, who is also a great teacher, is someone special indeed! The colors on this last piece didn't show up very well in the photography. The "lands" or "pods" look black, but are actually a deep purple with a bluish-green mist floating around them. Seems like a lot of my art has various shades of purple, but I've found that purples can be very difficult to photograph! The SALI Midwest National Abstract Exhibition continues through October 10th at the Garfield Park Arts Center, 2432 Conservatory Drive, Indianapolis, Indiana. Park on the upper level parking lot and enter through the north door. Hours: Sun, Tues, Thurs and Fri 1:00 - 5:00 pm, Wed. 1:00 - 9:00 pm, and Sat. 10:00 am - 5:00 pm (closed Mondays). Show is free to the public and all work is for sale. Contact Garfield Park for more info @ (317) 327-7077. UPDATE: The show is now over and when picking up our paintings, my mom found out she had won the "People's Choice" award! Yeah!! I just finished another mixed-media collage painting for the Suzi Blu workshop this evening. "Angel of Love" was created on a piece of 6" x 12" birch wood. I burned the image into the wood using a woodburning tool, then collaged and painted it, finishing with a coat of beeswax. I added some gold shimmer power to her hair and halo as a final step. If you need a beautiful guardian angel to watch over you, or someone you love, you can find her here. UPDATE: The original is SOLD. Loose prints and wood mounted prints available on Etsy. UPDATE: "Secret Garden" ORIGINAL is SOLD... Loose and mounted prints available in My ETSY Shop. I've had the most fun this week! I recently joined an online workshop with the very popular mixed-media artist Suzi Blu. Suzi has been giving us assignments via an online website, complete with video tutorials and printable instructions. I've met sooooo many talented artists across the world. Many are beginner artists and have never drawn or painted before, but have always wanted to. There are also many intermediate and advanced artists taking this workshop, as well. We're encouraged to post photos of our sketches and completed paintings as we go along. Everyone goes at their own pace, which is so nice. For beginners, it's kind of scary and can be intimidating. But Suzi virtually holds your hand through the entire process, guiding you along this mixed-media journey. Words of encouragement and acceptance are so important to artists. Even those artists who have a lot of previous experience need to feel appreciated and accepted. 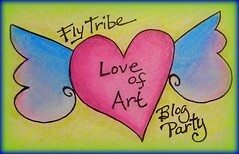 This workshop has blossomed into a wonderful and supportive online community. This week I got to experiment with new techniques I've never tried. This painting was created on 6" x 12" birch wood. The image was burned into the wood using a wood burning tool. What fun! I've still got a long way to go before I perfect that, as it's not as easy as you would think. Keeping the lines flowing smoothly and consistently, without letting the burning tool skip is a challenge. The other new technique was coating the painting in beeswax, then buffing it to a beautiful satin finish. I LOVE the way the beeswax makes everything so soft and dreamy! UPDATE: Sorry, the original is now SOLD. I do, however, have loose prints and mounted prints in My Etsy shop. I live with a professional photographer. My husband has been shooting for over 20 years... well, okay, over 35 years, but who's counting? Although his day job is a program manager, he photographs high school senior pictures, family portraits, nature photos, and weddings. As a matter of fact, that's how we met! Twenty some years ago I was working in advertising and two weeks before Christmas I lost my job. The agency had lost a major client and needed to lay-off ten people. One of those peeps happened to be me! As a recently divorced single mother, I was devastated. I hadn't even gone Christmas shopping for my daughter yet! I really needed a job, so my friend recommended I go to work for this freelance photographer she knew. She had been working for him, but had just quit and said I could probably take her place as his assistant shooting weddings. I did just that and the rest is history! What I perceived as a bad thing, actually was life changing, but in a good way. I didn't know it at the time, though. Funny how things happen, isn't it? So often something happens in our lives that throws us for a loop. We're caught off guard, and when it happens we really don't know how to respond. Sometimes it literally knocks us off our feet. And then there are those times when something so unexpected happens, we become mesmerized and can only watch the events unfold before our eyes in slow motion. It's as if time stands still. I'm reminded of September 11, 2001. All those people effected by such a tragedy. The entire country stood still and watched. A few years ago I did this mixed-media collage/painting, which has become one of my favorite pieces, called "And Time Stood Still". This piece was created with 9/11 in mind, and all the other events in our lives that are life changing, for better or worse. If you've had a life changing experience which you originally thought was unfortunate, but realized later it had a positive outcome, I'd like to hear from you. Please post a brief summary of your experience in the comments section. If you'd like to journal in depth about your experience, post the full version on your blog with a link to it in the comments section of this post.